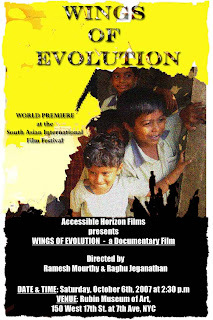 As some of you may know, Wings of Evolution is World Premiering at the South Asian International Film Festival 2007 on October 6th, 2007, which is a Saturday at 2:30 p.m under the Doc'Film Series 3. Do try to attend the screening and let us know what your thoughts are. Just a little information about the production and the team. This is the second feature-length documentary project by the Accessible Horizon Films team, the first one being Men of Burden - Pedaling Towards a Horizon. The film was finished in June 2007 and has just started going the festival route. This is way different from Men of Burden, not only in terms of theme, but also in style and tone - primarily focusing on children and the educational system in India and even focuses on global culture and understanding. Directed by Ramesh Mourthy & Raghu Jeganathan, Edited by Kousalya Jeganathan and Mohandass Radhakrishnan, Produced under the Accessible Horizon Films banner with excellent music by Composer Srikanth Devarajan of Studio 1234, the film has come a long way from production in Dec.2006. Check out for more updates soon. This is living smile vidya, a staff of SUYAM. Just to say hai and will get with a detailed letter soon. To know more about me kindly check up livingsmile.blogspot.com if time permits.